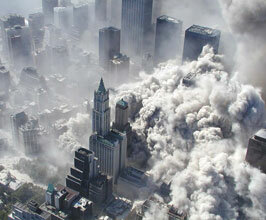 Chapman initiated a nationwide poll on what strikes fear in Americans. The survey included 1,200 participants. Learn more in the Division on the Study of American Fears. What do the 2003 American invasion of Iraq, banning gay marriage, outlawing marijuana, the Salem Witch Trials, and Voter ID laws all have in common? 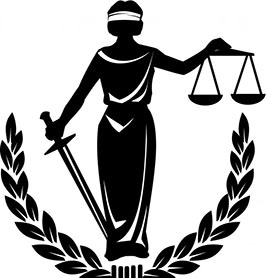 Learn more in the Division on the Study of Social Justice. Violence & Radicalization at CU promotes the scientific study of the causes & consequences of different types of violence with a focus on street gangs, hate crimes, & terrorism. 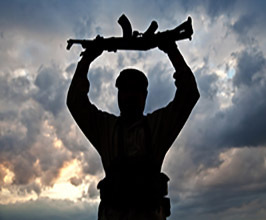 Learn more on the Division on the Study of Violence & Radicalization. 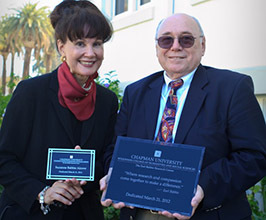 Suzanne and Professor Emeritus Earl Babbie help dedicate the Earl Babbie Research Center in 2012. 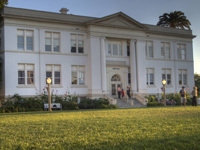 The Earl Babbie Research Center at Chapman University is dedicated to empowering students and faculty to conduct studies that address critical social, behavioral, economic and environmental problems. The Center’s mission is to provide research support and instruction to students, faculty and the broader community, and to produce research that addresses global concerns including human rights, social justice, peaceful solutions to social conflicts and environmental sustainability. The Babbie Center includes three major research divisions: the Study of Violence and Radicalization, the Study of American Fears and the Study of Social Justice. For more information about the Earl Babbie Research Center, please send us an email at babbiecenter@chapman.edu. 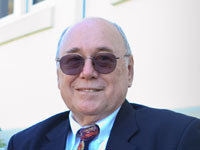 Due to the decades-long, world-wide popularity of his textbooks in social research, Dr. Earl Babbie is one of the most famous living sociologists today. He holds the position of Campbell Professor Emeritus in Behavioral Sciences at Chapman University. He is best known for his book The Practice of Social Research (first published in 1975), currently in its 14th English edition, with numerous non-English editions. The text has been widely adopted in colleges throughout the United States and throughout other parts of the world. He is also an author of research articles and monographs. Throughout his career he has been active in the American Sociological Association and served on the ASA’s executive committee. He is also past president of the Pacific Sociological Association and California Sociological Association. Check out Dr. Earl Babbie's research, Solutions Without Problems. Peter Simi joins us from the University of Nebraska Omaha where he was an Associate Professor of Criminology and Director of Radicalization and Violent Groups Research in the Center for Collaboration Science. He has studied extremist groups and violence for the past 20 years, conducting interviews and observation with a range of violent gangs and political extremists. Dr. Simi is a member of the National Consortium in Studies of Terrorism and Responses to Terrorism (START) which is a university-based research center committed to the scientific study of the causes and consequences of terrorism in the United States and around the world. His research has been funded by the National Institute of Justice, National Science Foundation, Harry Frank Guggenheim Foundation, Department of Homeland Security, and Department of Defense. Dr. Ann Gordon is associate dean of Wilkinson College of Arts, Humanities and Social Sciences and an associate professor of political science. She is the director of the Ludie and David C. Henley Social Sciences Research Laboratory. Dr. Gordon has published three books and numerous articles. She is Co-PI of the ongoing Chapman Survey of American Fears (CSAF), leading the team studying disasters and preparedness. The CSAF has been featured in over 800 print and broadcast media including the New York Times, The Huffington Post, CBS This Morning, Yahoo News, Good Housekeeping, the Washington Post, USA Today and TIME. Dr. Gordon works with emergency managers in Southern California on communicating preparedness to the public. Dr. Crystal Murphy (department of Political Science and Director of the MA in International Studies program) researches the lived realities of foreign assistance in conflict and post-conflict zones. Striving to understand the recipient views, together with Babbie Center student fellows, she studies the effects microcredit and cash transfer program provision in South Sudan. These projects include field interviews, qualitative and quantitative data sorting and analysis. Host conferences with internationally acclaimed scholars and practitioners. Provide seed grant money to encourage student and faculty research. Provide travel funds to students and faculty who need to do field work. Host visiting scholars and post-doctoral fellows. Develop Courses that support the goals of the Center. Setareh Motamedi is a Chapman Alumna with dual degrees in Political Science and Philosophy. During her time as an undergraduate, she conducted research on the fear of terrorism as it relates to public perceptions of Islam. 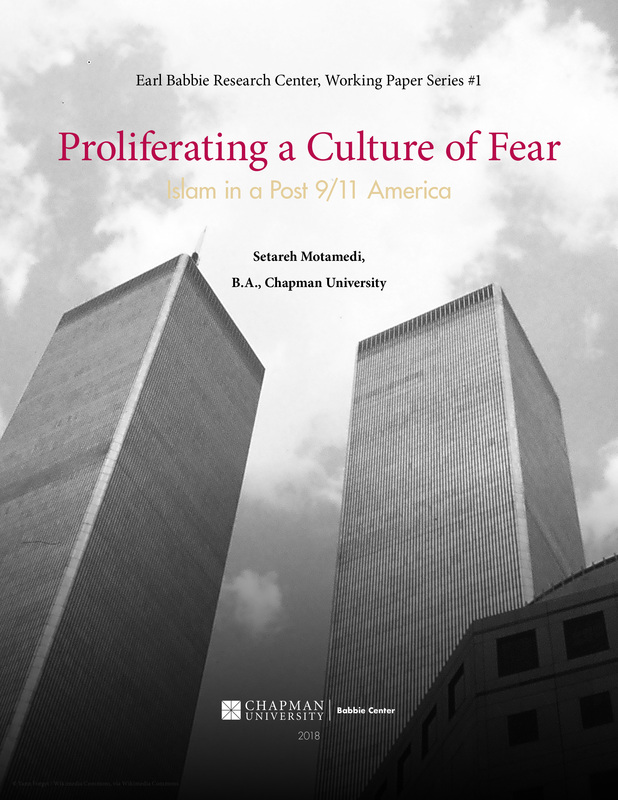 She presented this research at the 2017 Babbie Center Symposium “Understanding Violent Extremism in the 21st Century,” and eventually made it the subject of her thesis: Proliferating a Culture of Fear: Islam in a Post 9/11 America. Since graduating from Chapman, she has moved to Washington D.C. to pursue a Master of Arts in International Affairs from The American University School of International Service. There she will be studying US Foreign Policy and National Security with a concentration in Counterterrorism. After graduating from American University, she plans to pursue a career in national security. The Babbie Center has moved! We are now located at 417 Walnut Street! Drop in and say hi!